he Grant Trunk Road - possibly the oldest surviving highway in the world - starts out in what is now Bangladesh, makes its way through the Gangetic plains, crosses Delhi, and moving northwards, passing the town Sonepat, the historic battlefield Panipat, the refinery at Karnal, and along the way to Ambala and beyond, if you blink you miss it - Kurukshetra. Even as recently as a decade ago, in the absence of flyovers, it was routine to get stuck in hour-long traffic jams while trying to cross the intersections of these towns. There is now an overpass that takes you right over the intersection of the national highway and the State Highway 6 that makes it way to Kurukshetra on one side and to Yamunagar on the other. So unless you are looking for the town, you are likely to miss it. But if you do remember to look left (if travelling north), you cannot miss the welcome arch over the road that leads into the city. Whether you are passing by or whether entering the city, do look at the impressive arch. 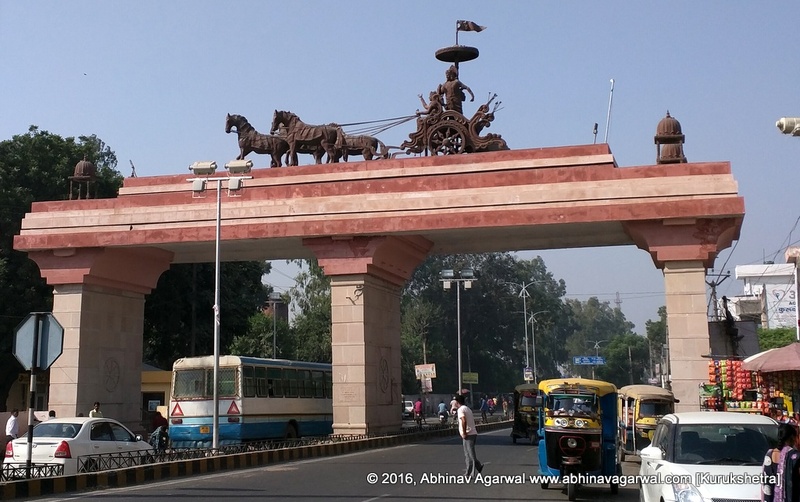 If you do, you will spot the famous, immortal chariot from the Mahabharata atop the arch. Arjuna's chariot, with Krishna the charioteer. Arjuna's bow - the Gandiva - is down. As long as it stayed down, so did the Pandava's hopes of winning the dharma-yuddha. One hand of Krishna holds the reins of Arjuna's horses - literally and metaphorically - while the other hand is raised, in explanation. This arch is lit up at night, and the visage is all the more impressive, and indescribably evocative. hat is the etymology of the word “alcohol”? In her 2013 book, "Rama and Ayodhya", Meenakshi Jain had presented perhaps the most accessible, authoritative, and comprehensive account of the literary, sculptural, epigraphic, and historical evidence to support the antiquity and ubiquity of Rama across India, in addition to summarizing the findings of the Allahabad High Court's verdict on the case. Her 2017 book, "The Battle for Rama: Case of the Temple at Ayodhya", builds upon "Rama and Ayodhya" with new information and evidence that has come to light in the last few years. While it is a short book, at 160 pages, it is nonetheless lavishly produced, with 61 illustrations and full-colour photographs printed on glossy paper.